First, there was an accident in the last update. Page 15 was not uploaded properly. Because of that most of you probably haven’t read it. I fixed the problem and you can read it now. Sorry about that. A lot of you were probably very confused because the conversation with Aex probably seemed like it ended quickly. 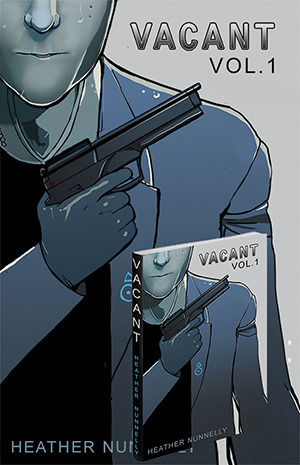 Second, as everyone may know, the guest art submissions are closed for Volume 1 of VACANT. If you missed your chance, there will be another one for Volume 2 of course, but that will probably be a year from now. Because the Kickstarter has gained a lot more money than I thought (I was preparing for $3,000 if it went over the goal amount) everyone who submitted will be printed. Which is good because there was no way I was going to choose because I liked them all so much. They were all, seriously, very impressive. Thank you to everyone who sent me art. To see all the guest art, you can look through my tumblr or get the graphic novel. Which will hopefully be available to buy in a few months. You can also pledge to the Kickstarter if you want a copy that way. Thank you to EVERYONE again! !